We at Pure Jeevan enjoy eating salads. Each of us has our own way of dressing our individual salads, but we all thoroughly enjoy very large bowls of them at least once a day.In the past, salads were those "diet" meals that I'd consume when I was trying to lose weight. I'd sit at the table staring at my small plate of greens, feeling like I was missing out on the "great" food everyone around me was eating. I'd feel hungry after my meal and extremely unsatisfied. * We started viewing food (raw food) as what it truly is: a source of life-giving properties that our bodies need to thrive. Who can look at a salad in a negative way with this mindset, right ! * Going on a "diet" wasn't something we were interested in anymore. We were looking for a lifestyle change, not a way to deprive ourselves in order to lose weight. Salads became food, not deprivation. * An unhappy small plate of greens transformed into a large joyful bowl of vitality! 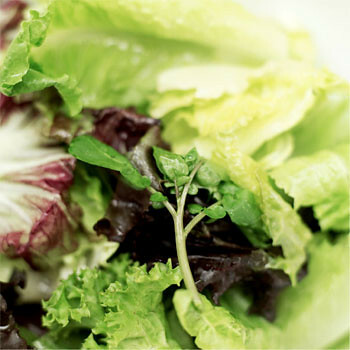 * We began using our intuition when choosing ingredients for our salads. There was no longer a one-topping-fits-all salad mentality in our home. Here's my current favorite salad that I've been eating a lot lately. When Jim dresses his salads, he includes all kinds of ingredients. His current favorites seem to be: sunflower seeds, raisins, pepitos, and cucumber.He doesn't use olive oil in his salads (some day I will give up the olive oil, but I'm not ready for that, yet). Jim also almost always consumes a large grapefruit, or two, after each meal. I've never tried tahini on my salads. If I decide to try it, I'll let you know what I think. I go through stages where I'm into walnuts. I like them mostly with chopped apples and a bit of agave. Yum! Is this the kind you had me try at trudi's? Thanks for stopping by. This is very similar to the one you tried. I'm sure you'd love it, if you decide to make it for yourself!